This twenty two page activity book is divided into sections covering numbers, letters, classifying and ordering, math basics, color identification, pattern recognition, and physical & navigational safety practices. The author’s developed purpose for the activity book was to incorporate the fundamental building blocks of education and pair them with safety practices. 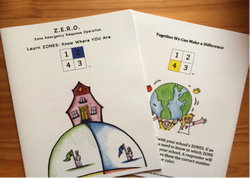 Upon completion of the activity book, all students will have the same frame of reference and ability to identify the fundamentals of the Z.E.R.O. program. Every student’s ability to comprehend the specific colors assigned to navigational direction will assist students on directional orientation. A signature page was embedded on the last page of the activity book; our purpose was to provide an opportunity for the student’s guardian to review the activity book with them. This twenty three page activity book is divided into sections covering numbers, sentence structures, grammar, writing, vocabulary building, reasoning, critical thinking skills, diagramming, research skills, and physical & navigational safety practices. The author’s developed purpose for this activity book was to engage the student’s mental acuity by applying critical thinking procedures. Upon completion of this activity book, student’s will have a better understanding on safety procedures. Every student’s ability to comprehend the Z.E.R.O. program will improve their assessment and evaluation response during a problem solving incident. A signature page was embedded on the last page of the activity book; our purpose was to provide an opportunity for the student’s guardian to review the activity book with them.